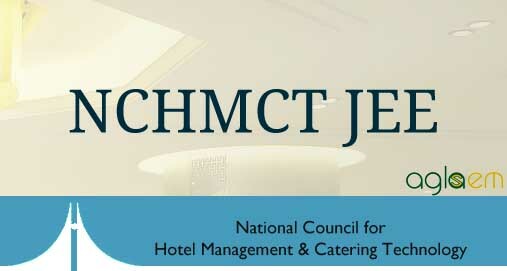 NCHMCT JEE Result 2018 – National Council for Hotel Management & Catering Technology (NCHMCT) has announced the result for NCHMCT JEE 2018. The result has been uploaded in online mode only. No printed result will be sent to candidate individually by post/email. Candidates who would appear for the exam can check their result by entering their Application Number, Roll Number, and Date of Birth. The selection of the candidates for admission into Bachelor of Science in Hospitality and Hotel Administration will be on the basis of the All India Merit List. 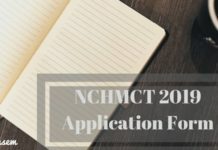 Candidates can check more details about NCHMCT JEE 2018 Result from this page. 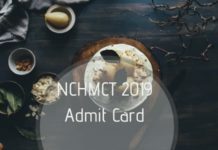 For NCHMCT JEE 2019 Result – Click here. Check Result: Click Here to check NCHMCT JEE Result 2018. 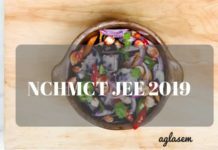 How to Check the NCHMCT JEE Result 2018? Enter the details such as Application Number, Roll Number, Date of Birth in the specified fields. The result will appear on the screen. The candidates may download and take printout of the result for future references. The exam conducting authority will also publish an All India merit list of candidates. The merit list will be prepared on the basis of marks secured in the JEE Written Test. The selection of the candidates for admission to Bachelor of Science in Hospitality and Hotel Administration will be on the basis of the marks obtained in the written test and subject to fulfillment of the eligibility criteria as laid down by the National Council for Hotel Management & Catering Technology. In case of tie still not resolved, the candidate older in age will be given preference over younger candidate. It is mandatory for the selected candidates to register online at nchmcounselling.nic.in to participate for the seat allotment. Candidates need to enter their Roll number, Application number, Candidate’s Name, Date of Birth, Password. The registered and eligible candidates are required to give their choices of institutes in order of their preference. Candidates are allowed to fill in as many numbers of choices in the order of preference from the list of available institutes. If the student desire to change or re-order their choices, delete earlier choices and add new choices any number of times until they lock their final choices. If the candidate is satisfied with the choices filled, they must lock their choices. After the choices are locked, candidates cannot change their choices any further. Candidates must take a printout of the locked choices, sign it and produce it at the time of reporting to the Reporting Center. The choices finally submitted and locked by the candidates in this round will be processed and seats will be allotted to the candidates in the order of merit as per All India Rank and also on the basis of applicable reservation criteria. The seat allotment result will be published on the website only. The candidates can check their seat allotment result by entering their Roll Number and Password. The candidates who will be allotted a seat are required to download the provisional Seat allotment letter and make a payment of Seat Acceptance Fee of Rs. 57,500/- (for all candidates) online via Debit card, Credit Card or Net Banking or by Demand Draft. Such candidates are required to report Reporting Centre with the original Demand Draft. 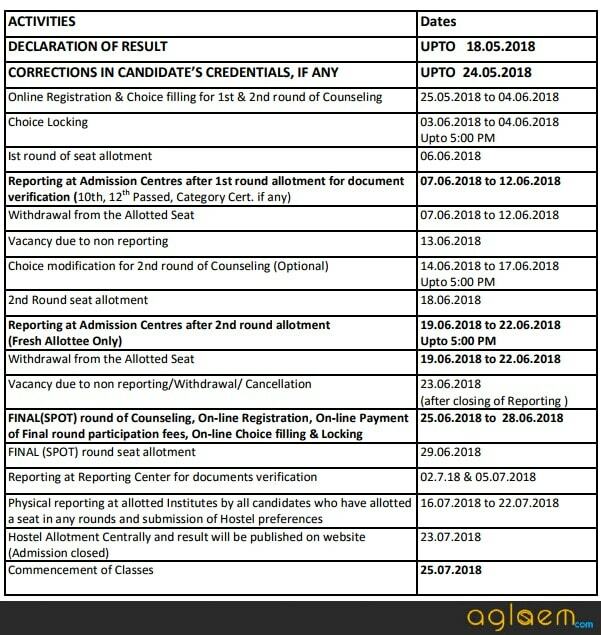 It is important that candidates should report at the allotted center at the given schedule or otherwise the allotted seat would be cancelled and they would not be considered for seat allotment in the 2nd round of counselling but will be eligible for Spot Counselling. Float Option – In case the candidates choose the Float Option, their earlier allotted seat would be automatically cancelled and the cancelled seat would be offered to the candidate next in the merit. 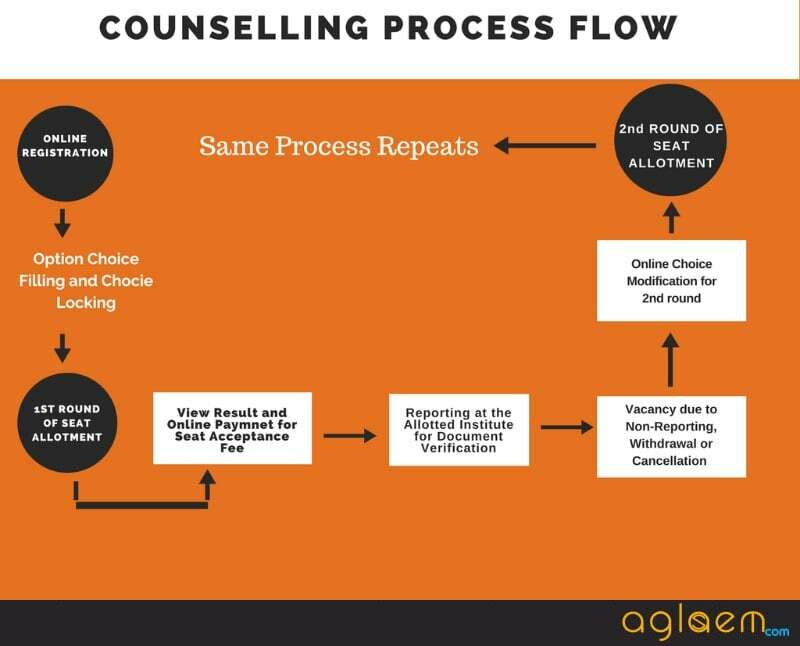 Freeze Option – In case the candidate chooses the Freeze Option, then they would not be considered for seat allotment in the 2nd round of Counselling. Whereas, such candidates will be considered for category upgradation against the same allotted seat. After the completion of the 1st round of seat allotment, the Reporting center will issue the candidates a Provisional Admission Letter, containing seat allotment details of Institute, personal data of candidate, fee paid and willingness option exercised for upgradation (Float/Freeze). Candidates who were registered in the 1st round of counselling will be eligible in this round and no fresh registrations will be allowed. Those who are not reported at allotted institute for document verification after seat allotment in the previous round. Those candidates whose allotted seat were cancelled due to non-fulfillment of documents & other criteria of admission. Group 1 (Fresh candidates) Candidates who are not allotted any seat in the 1st round of seat allotment are allowed to change their earlier submitted choices If candidate is satisfied their choices, their choices submitted during the first round of counseling would be considered for seat allotment. Group–III (Reported and Freeze candidates) Candidates who were allotted a seat but they choose the Freeze option. In this case, candidates will not be allowed to add/modify new choice. The result for 2nd round of seat allotment will be published at the website. For Group-IV candidates a new seat will be allotted out of the choice preferences given in the previously allotted seat. In case no new seat is allotted then their earlier allotted seat would be retained. However their allotted category may be upgraded. Group–I and Group-II candidates who have been allotted a fresh seat in this round, have to report to any Reporting Center for provisional admission during the specified time period and schedule. Failing to do their allotted seat would stand automatically cancelled. However candidate will be eligible for Spot round of counselling. The reporting procedure at the reporting center for provisional admission is same as the 1st round of counselling. Group–III candidates shall be allotted seat as in the previous round of counseling. So, they need not require to report anywhere. Group–IV candidates may get allotted a seat of higher preferred choice or their previously allotted seat is retained. Such candidates are not required to report any where. Official details of NCHMCT JEE 2018 Result are available but not that of counselling. Information on this page for result is as per brochure and that on counselling is as per ;ast year brochure and only for reference.